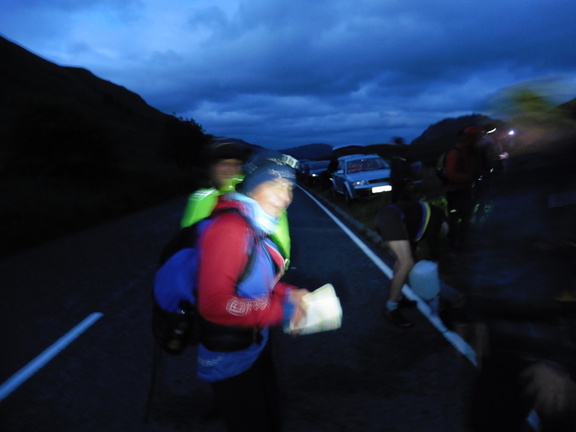 ...”Storm force winds on the tops and heavy rain were promised but didn’t really materialise for the race but the short course was never really a consideration with the high points on the course being visited only briefly. A slight change to the finish of the route meant that this ‘not to be under-estimated 16 miler’ was in fact just short of 18 miles with an extra big climb just before the finish. The route change went down well, certainly with the Dark Peak contingent, first 3 men (well done Adam, Craig and Tom), Helen clocking in for a prize along with Mike Nolan (first V50) and Jane Crowson (first LV50). The consensus after the event was the last climb was a worthy addition to an already fine route and that the rolls and soups were mighty good. Same second Saturday in Feb next year."